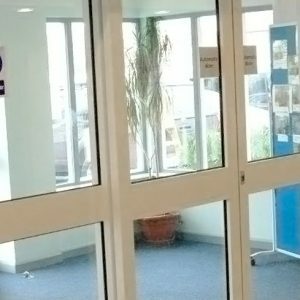 Automatic balanced doors are an ideal solution when you want to enjoy the many benefits of an automated entry system, but you simply do not have the space for sliding or telescopic sliding doors. BBG Automated doors systems create the impression that your firm is established, professional, and trustworthy. In addition, if your building is open to the public, you are required under the AODA to take measures to improve accessibility for all visitors. Installing automated doors is a key means of ensuring that visitors with mobility issues are still able to access your premises. Automated doors are increasingly becoming a standard feature on many buildings across the Canada. It is no surprise that many companies are looking to install automated entry systems of their own. However, space limitations are a very real issue for many businesses. 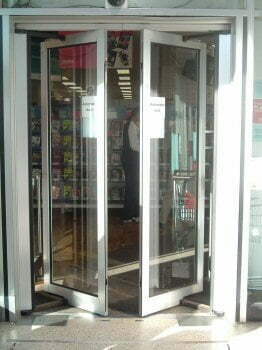 Indeed, for buildings with restrictive space constraints, automatic balanced doors are often the only natural solution. The balance in these doors means that no force is necessary to open the door and the door movement is controlled. Beyond saving space, there are additional benefits to choosing automatic balanced doors. First of all, balanced doors are designed to be as easy to open and close as possible, even against harsh winds. It is for this reason that automatic balanced doors are often found on storefronts and in bus stations, where they can still provide a convenient ease of entry without struggling against the force of high winds. Finally, the construction and mechanism of automatic balanced doors means that even the largest and heaviest of doors remain easy to open. You can therefore boost security without compromising on accessibility, resulting in years of low maintenance, easy access. At BBG Automatic Doors, we can plan, specify, design and install bespoke automatic balanced doors in strict accordance with safety standards. As an independent company, we have been able to develop deep and varied product knowledge of the entire automated door market, which means that you can expect nothing but the best from us. To find out more about how you could benefit from automatic balanced doors, please do not hesitate to get in touch.